U.S. 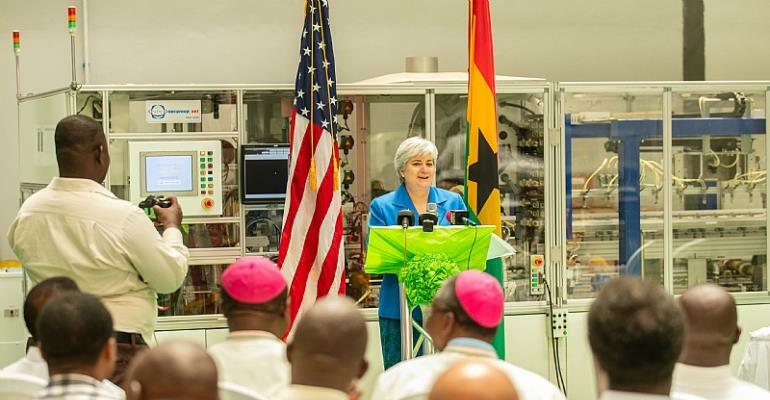 Ambassador to Ghana Stephanie S. Sullivan led an event today in Kpone to mark the new partnership between the Ghanaian company Strategic Security Systems International, and its subsidiary Strategic Power Solutions, with the U.S. Company AEG International. Their initial objective will be to provide solar energy to six dioceses of the Ghana Catholic Church. The U.S. Trade and Development Agency (USTDA) is providing grant support for AEG International to work with Strategic Power Solutions to conduct a detailed feasibility study for the project. The energy for the project will be generated from solar panels assembled in Ghana and from inverters, batteries, and other equipment manufactured in the United States. The solar panels will be assembled at Strategic Power Solutions’ (SPS) manufacturing facility in Kpone, where today’s event was held. Bishops and their representatives were present from the six dioceses of Techiman, Greater Accra, Koforidua, Keta-Akatsi, Kumasi and Tamale. Within the six dioceses, there are 28 health clinics and 310 schools, amongst other facilities, that will be transitioned to solar power through the project. The decision to move to solar power is cost effective and will improve the lives of citizens throughout Ghana. The United States of America is a leader in clean energy and innovation and understands the need for transforming energy systems. Through Power Africa, the United States has catalyzed some $60 billion in energy investments that will provide modern energy services for roughly 300 million citizens across Africa by 2030. USTDA provides grant funding for feasibility studies for public or private sector infrastructure projects in Ghana and in other middle or low-income countries around the world. These grants help meet USTDA’s dual mission of helping ensure the development of sustainable infrastructure projects and helping support the use of U.S. equipment and services. Strategic Security Systems International Limited's Chairman, Dr. Francis Akuamoah Boateng noted, “We hope this new partnership will mark the first of many projects together. Solar power is an incredible opportunity for Ghana.” The company’s subsidiary, SPS, has 150 Ghanaian employees, with 18 satellite offices throughout Ghana. SPS has an annual production capacity of 32MWp of solar panels, and, with an expansion underway, it will have the capacity to produce 165 MWp of solar panels annually. AEG International President Tod Skinner said: “This project will benefit [Ghanaians] by bringing solar power to schools, clinics, hospitals, and other facilities. AEG International is proud to partner with SPS and Strategic Security Systems International to create jobs in both of our countries and be part of a project expected to have such great impact in Ghana.” AEG International is based in Charlotte, North Carolina, where its engineers design and build products used in over 20 countries, including Tanzania, the Democratic Republic of the Congo, Kenya, Ethiopia, Liberia, Rwanda, and Nigeria, with plans to expand its presence in Africa.